Addresses joint stiffness of the knee by using a low load, prolonged stretch modality. 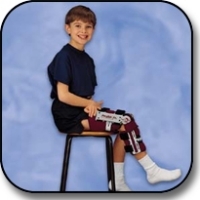 It gently restores range of motion and resolves joint stiffness in children and small adults. The orthosis features combination flexion/extension in one unit, and a Pro-Lock EZ application system for simple donning and doffing. The unit comes with machine washable liners. Weight: 1 lb. 10 oz. Replacement softgood kit available. Thigh circumference: ......Less than 14in.